The Latino National Republican Coalition of Texas was built in order to find ways to connect the Latino community with the Republican party. For three years we have maneuvered around Texas working at the grassroots level, recruiting leaders, working the media, and finding ways to make conservatism relevant in the lives of those who have never been approached by the Republican Party’s brand. As chairman of the LNRC of Texas, I thought it would be through the Evangelical Hispanic community in Texas that we would find the first key opportunity to build a network that would shatter the stereotypes held on Latino voters. There has been interest among key Christian pastors rising up and matching up their virtues with our message on certain issues, but there are still years of work ahead on this front. However, recently, we have been blessed to witness our LNRC of Texas network finding synergy with a key social institution that lately has been under attack by the Obama administration. The Catholic church and its members who lead various faith based organizations in the last weeks are facing a serious threat from the federal bureaucracy. This past weekend we entered a new territory for Republican “outreach” led by our high energy Bexar County LNRC chapter chairman Alex Sostre Odio. San Antonio to many might be a Democrat stronghold, but we have identified an opportunity, a challenge that can be taken on by sharing a new brand of Republican activism that has already delivered results for us across Texas. On Saturday we stood as Catholics, as Christians, and as proud Republicans who believe that religious freedom is of paramount important to all Texans. A counter protest led by Planned Parenthood only had 100 in attendance. Ours had over 300 while in the middle of a rainstorm. 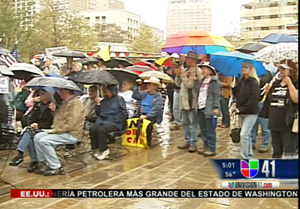 We were able to headline the Spanish media on Univision, pushing a new media narrative to San Antonio voters that clearly shows Obama’s policies at odds our values and beliefs when it comes to their religious freedom. We were able to stand with the San Antonio Tea Party, State Rep John Garza, Mayor Art Martinez de Vara, Young Republicans of Bexar County, Alamo Heights High School Young Republicans, Alamo Pachyderm Club, Allan Parker, The Justice Foundation, Bexar County Republican Women, Churchill High School Young Republicans and the list goes on and on. It is satisfying for us to know that Democrats must be scrambling trying to find ways to explain their hypocrisy to the Latino community when it comes to the attack on the Catholic church. Giving the Democrats a little of their own medicine for once is something that is firing up our LNRC of Texas membership. Having news anchors place the word “Obama”, “Catholics” and “concerned” in the same news report is like having a seriously large wrecking ball at your disposal to chip away at the previously unchallenged wall around the Democrat Party and the Latino community in Texas. Our LNRC of Texas members are confident, building relationships, working the grassroots from the ground up, changing the future of Texas. While the rest of the Republican nation grieves California’s GOP comatose condition and while Alabama, Arizona and other state Republican parties are stuck in a enigmatic defensive mode when it comes to the Latino vote, we are sure that Texas can be different . Texas Republicans can overcome this political divide, and the LNRC of Texas will be the bridge to make it happen.